Hi, I am interested in your 1940 Ford Pickup (stock #4423-CHA) listed on Autotrader for $29,995. I'd like to get more information about this vehicle and confirm its availability. This is the kind of truck that knows the difference between just showing up and being the kind of vehicle everyone remembers. Detailed paintwork, coordinating interior, and supercharged big block power come together in this 1940 Ford pickup to make one terrific unforgettable total package. In 1940, Ford created one of the most stunning pickup designs for the ages. This one celebrates that style by utilizing the full custom build to highlight all the best features on this icon. It starts up front where the bumper has been removed so you can get the full view of that awesome pointed break that was shared with the classic car line. Plus, the red has the kind of candy-coated lusted to really bring out the smooth lines in the hood and cab. The black in this two-tone is just as important. It emphasizes the round fenders up front, where it really draws attention to the teardrop headlights. Everyone loves this Ford for the artfully long rear fenders and these now flow uninterrupted because the taillights are now integrated into the custom roll pan. But the best part here is the element of fire. You see it in the custom red pin striping and the design of the 18-inch Progressive alloy wheels. That monster hood scoop boldly leading the way, you almost expect flames to shoot out of the dual exhaust. 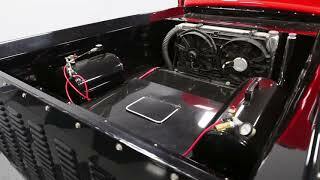 Inside, the custom black and red theme continues on the cool striped bench seat and door panels. So you know people are going to marvel at the interior. And when they do, theyll also love items like the billet handles and bright dash. Additionally, everyone will marvel as you use the air ride controls to lower this one in the parking lots. But more than just a looker, you can tell this was meant to be driven. Thats why you have a three-spoke sports steering wheel, Lokar shifter, and a full set of AutoMeter gauges. In fact, have you spotted the large tach with shift light and the blower readout? Oh yeah, this is one serious machine. You know two things the moment you pop the hood. First, you can see there was plenty spent on a bright and clean presentation. Second, you know they couldnt possibly put any more muscle in the engine bay thats why the big butterfly scoop has to raise out of the hood. For most people a 454 cubic-inch big block V8 is plenty of power, but not something as wild as this one. Thats why there are dual Edelbrock four-barrel carbs sitting on top of that big B&M blower. Youll love the intoxicating mix of thunderous big block rumble combined with the whoosh of the blower force-feeding that V8. This is a serious street machine, and thats why you have a stout TH400 three-speed automatic and a custom frame to handle all the extra power and torque from this monster motor. Plus, the front suspension was upgraded to a robust Mustang II-style setup and front disc brakes. In the rear, you have a strong set of ladder bars keeping the rubber on the road. We know youve been totaling up what it would take to get the paint, interior, and big power motor like this one here. You know the asking price is far less than you could have it built from scratch. Best of all, this is a dream machine thats turnkey ready today for the first person to grab it. Call now!